President Larry Roberts called the meeting to order at 6:43 p.m. Directors present for the meeting were Doug Alred, Jane Alred, Bonnie Brooks, Errol Daniels, Susan Haag, Franz Lerch, Todd O’Donnell, Ty Payne, Larry Roberts, Larry Sassa, Connie Smith, Paul Smith, Lamar Strother, Douglas Tillett, and Jim Van Cleave. Directors Angela Harris, Stan Lambert, and Stuart Toomey were absent. Approval of 12/5/17 (December meeting) minutes: On a motion by Lamar Strother and seconded by Douglas Tillett, the December board meeting minutes were approved as submitted. Election of 2018 Club Officers – We always elect our executive board at the beginning of the first meeting of the year. For the office of President, Larry Roberts was nominated by Douglas Tillett. There were no other nominations. The vote was called and Larry Roberts was unanimously elected President. For the office of Vice President, Larry Sassa was nominated by Jane Alred. There were no other nominations. The vote was called and Larry Sassa was unanimously elected Vice President. For the office of Secretary, Errol Daniels was nominated by Douglas Tillett. There were no other nominations. The vote was called and Errol Daniels was unanimously elected Secretary. For the office of Treasurer, our rules call for the president to name the candidate he deems best to serve as Treasurer, then the board approves his nomination. President Roberts named Bonnie Brooks as his choice for Treasurer. The board unanimously approved Bonnie Brooks for Treasurer. Committees for 2018 – A brief overall of all the committees’ needs and focuses was given, then a sign-up sheet was passed around for review. Board members were asked to select which committees they wanted to be a part of, whether that meant being added or removed from the previous year’s committee. Treasurer’s Report: Treasurer Bonnie Brooks distributed copies of the Balance Sheet and the Profit and Loss Detail Statement through December of 2017 and then thoroughly explained all the line items. As she went through the line items, she mentioned that it was a busy month in December. JU Running Lab – Todd O’Donnell reported that the running lab has 10 appointments signed up through January for VO2 max and biomechanics analysis. The spring tuition was just paid for the JU graduate assistantship position. The lab will be on display at the Donna Marathon expo so that members and non-members can get a more in-depth look at the process. Also, Simon from 1st Place Sports has been trying to set up demonstrations for the Galloway Group in conjunction with the lab and JTC Running. Currently JTC Running members receive a discounted rate for an analysis and more information can be found on the 1st Place Sports website as well as our website. 2018 Track Series – Our first scheduled meet will be next Saturday, January 13th, at 8am, located at Creekside High School. Registration is available on the website now. 2018 Gate River Run Training Class Kickoff – Our Gate River Run training class kickoff with Coach Jennifer DeSantis was scheduled for Thursday January 3rd, but had to be cancelled due to upcoming inclement weather. The kickoff will be rescheduled for next week on Jan 9. Currently we have as many as 50 participants signed up for the class. Run, Jump, Throw 2018 – Larry stated that we would wait to further discuss the Run, Jump, Throw event until Angela Harris returned since she is our lead liaison for this event. Last Gasp (Sat 12/30/17) – Our final count of race participants was 257 runners which included 20 day of race signups. The feedback obtained from runners was that it was an enjoyable event on a very cold race day. The menu consisted of sandwiches and soup rather than the pizza that was served last year, and was a hit with the cold race day temps. Going forward and something to think about for next year’s event, we need to make sure we have enough members or volunteers on hand to close and break down the finish line area. Winter Beach Run (Sun 1/21/18) – Doug Alred reported that the event is all set and open registration emails have been sent out. We are currently 3 weeks away with more than 300 entries, so we are on pace for another good turnout. We have various volunteer groups already set up to assist, so Lamar will not need to reach out to members for assistance as we have done in the past. Gate River Run (Sat 3/10/18) – Doug Alred reported that almost all permits have been obtained. Also, that this would-be a down year in terms of sponsors, however sponsorship numbers are still good. We have had over 1,200 race entries within the last 3 days and this is usually the time of year when more entries start to roll in. CLASSES & CLINICS – Jane Alred reported that there is currently a hold on upcoming classes however she will be getting with Jeff Wight of JU to schedule more clinics soon. 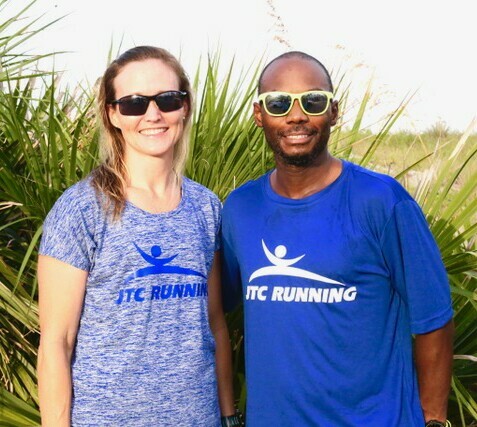 As before, the clinics for 1st Place Sports and JTC Running will be in conjunction with the Running Lab with a focus on health and fitness concerns of our local running community. As part of that partnership, the Running Lab will be on display during the Donna Marathon Expo. COMMUNITY & PUBLIC RELATIONS – We are currently discussing options and looking for someone to take over the responsibility of the JTC tent at Gate River Run. Larry Sassa is currently communicating with the group we used previously for the food in tent area. In the process of looking for suggestions and recommendations for catering, in terms of the best ways to keep it sanitary. Another idea we wanted to revisit is the idea of having a special “JTC Gate” brew for the members-only tent area brewed by Wicked Barley, or another local brewery. We also needed to devise a plan on our public relations and press releases for the Gate River Run now that our previous person has retired from the board. FINANCE – Bonnie Brooks reported that a Finance Committee meeting was held at 6 pm prior to our monthly board meeting. For the past several months, we have been discussing our club’s role in the creation of a trail master plan for the city that is being coordinated by Groundwork Jacksonville. Bonnie made a motion, seconded by Douglas Tillett, that we contribute $50,000 to Groundwork Jacksonville. Our contribution, along with a contribution from another source, will result in the trail master plan being developed. The master plan is required before any actual trail construction can be done. JTCR will have a seat on the steering committee for this project. In other Finance Committee action, Bonnie made a motion, seconded by Franz Lerch, that we make a contribution to Friends of Guana of up to $1,000, in recognition of their support for our Guana Trail Races. The motion passed. The committee also recommended to the board that we spend up to $1,500 to purchase an inflatable JTCRunning arch, suitable as a race finish line. A motion was made and passed for this item. MEMBERSHIP – Larry Roberts reported membership is currently at 1,116 active members, of which several were new members gained from Last Gasp. MERCHANDISE – As previously mentioned, we want to see about providing online orders for merchandise like other running clubs. This should allow us to reduce the need for storage and inventory, while selling more merchandise. Connie stated that she would research the costs associated with this type of service. It was also suggested that we possibly consider the kid and leisure wear apparel markets. An inventory of our current merchandise will be completed before we make any decisions and before the Donna expo. COMMUNICATIONS: Newsletter, Social Media – The current issue has been printed and is currently in the mail. The newsletter is accessible via the email blast that has been sent out. Deadline to make the next issue is January 10th, however arrangements can be made to extend the deadline until the 15th if someone needed additional time to submit a story. Larry mentioned that the online version of the newsletter can include hyperlinks, color, and more stories and would not cost that much to streamline our communication process. The format could be like the 1st Place Sports magazine that was emailed on 1/2/18. VISION & PLANNING: Tomahawk Park repairs/cleanup/plaque – Doug Alred was glad to be able to report that Tomahawk Park and our running trail there have been cleaned up very well. The bridge we had built survived. He suggested for us to go for a run there. NEXT MEETING – The next board meeting will be Tuesday, February 6, at 6:30 pm in the Mediterrania Restaurant. The January meeting was adjourned at 7:49 pm.